Are you as inspired (as alive!) by your career and work as you once were? Integrity, the adherence to principles, is a supreme value in most corporations. Yet, our observations lead us to believe that the greatest violation of integrity in organizations goes unaddressed: the employee’s integrity to self. The system, and certain styles of leadership by those we are forced to follow, will harden us if we allow it to. Some around us in the organization succumb to behaviors we wouldn’t tolerate in our children. They manipulate, they play king, they lie, they brag, they deceive, they blame, they hide. When such actions are displayed by the few we may begin to suspect the whole. We will be tempted to quit believing that the majority is virtuous. When we refuse to cave to such small thinking, we realize a greater potential within ourselves for leading productive change – and become a model for those who wish to do the same. 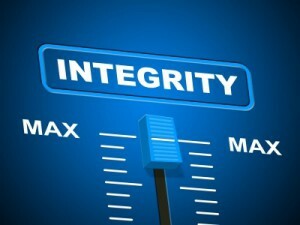 Most importantly, we remain in our own integrity. This is not an appeal for a blind idealism. It’s a call for courage over timidity. Take decided action with the few who choose not to participate with integrity, while retaining enthusiasm for the whole. Doing so means we are true to who we are. If you walk around as if you’re on fire, if you’re alive with the idea that most people want to do well for others, then we are with you. Your team will be with you.